October 13th, 2015. On this day Bandai Namco US announced a special bonus for those who preorder the PlayStation 4 edition of Digimon Story Cyber Sleuth. The preorder bonus includes Black Agumon and Black Gabumon, which unlock their respective evolutions up to Omegamon Zwart. (Referred to as "Black Omnimon" in the English localization.) The extra content will also include Beelzebumon Blast Mode and Cherubimon Vice, which are Digimon new to Cyber Sleuth, not found in Japanese game. The bonus will also include the three cosplay Agumon found in the Japanese preorder bonus, who mimic the outfits of the male and female protagonists Aiba Takumi and Aiba Ami, and Digimon Adventure protagonist Yagami Taichi. The status of the Japanese preorder DLC, which contains the quests featuring Sayo from Digimon Story Moonlight and the Seven Great Demon Lord superbosses, is currently unknown. Some concerns have arisen among fans questioning if PlayStation Vita and PSTV users will be able to access the content, as no similar preorder bonus has been announced for the Vita version of the game. Previous digital-only Vita games have included similar preorder deals as day one content accessible by purchasing and downloading the game within the first week of its launch. 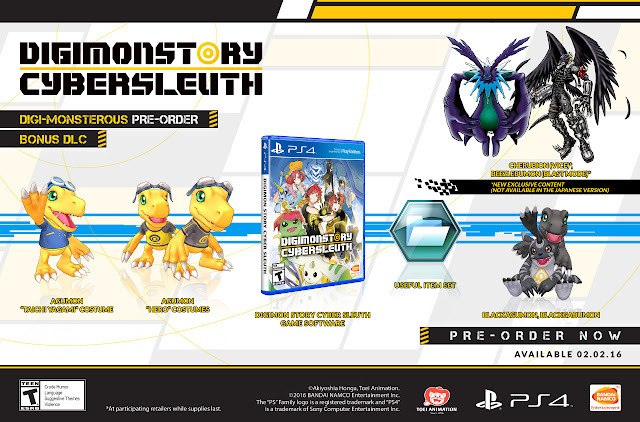 Digimon Story Cyber Sleuth will launch February 2nd, 2016, on the PlayStation 4, Vita, and PSTV for $59.99.